Ingredients: Water sufficient for processing, chicken, meat by-products, chicken liver, poultry by-products, natural flavor, calcium carbonate, sodium tripolyphosphate, added color, potassium chloride, carrageenan, dried yam, dl-methionine, salt, xanthan gum, erythorbic acid, l-cysteine, taurine, choline chloride, guar gum, vitamin E supplement, zinc sulfate, thiamine mononitrate, ferrous sulfate, sodium nitrite, manganese sulfate, copper sulfate, pyridoxine hydrochloride, vitamin D3 supplement, folic acid, menadione sodium bisulfite complex. This product is manufactured by Mars Petcare Inc.. According to our data, this Whiskas recipe provides complete & balanced nutrition for adult cats and growing kittens. In other words, this formula is AAFCO approved. Whiskas Savory Pate Roasted Chicken Dinner In Meaty Juices is formulated to meet the nutritional levels established by the AAFCO Cat Food Nutrient Profiles for adult cats and growing kittens. 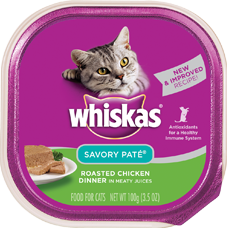 We'll begin this review of Whiskas Savory Pate Roasted Chicken Dinner In Meaty Juices with a detailed discussion of the ingredients. The first ingredient is water sufficient for processing, which of course provides moisture. The third ingredient is meat by-products. By-products are defined by AAFCO as the "non-rendered, clean parts, other than meat, derived from slaughtered mammals." 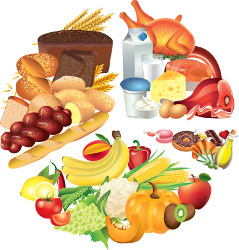 Thus, meat by-products contain nearly all parts of the animal which are typically not consumed by humans. These parts include the liver, lung, spleen, kidney, stomach, blood, intestine, bone, etc. The fourth ingredient is chicken liver. Chicken liver is an excellent organ meat which provides high quality protein and fat. In addition, chicken liver provides many essential vitamins and minerals. The fifth ingredient is poultry by-products. By-products are defined by AAFCO as the "non-rendered, clean parts, other than meat, derived from slaughtered mammals." Thus, poultry by-products contain nearly all parts of poultry which are typically not consumed by humans. These parts include the liver, lung, spleen, kidney, stomach, blood, intestine, bone, etc. Like other meat by-products, poultry by-products are considered controversial, mainly because they are inexpensive ingredients which consumers have equated with slaughterhouse waste. However, manufactures and many experts claim that animal by-products are unjustly criticized. Proponents state that by-products, such as poultry by-products, supply many important nutrients required by cats. Finally, we must also note that this ingredient is considered an anonymous meat ingredient because the specific type of poultry is not specified. By-products which are "named", such as chicken by-products are typically higher in quality when compared to the more general poultry by-products. Because ingredients are listed in order of pre-cooked weight, the remaining ingredients in Whiskas Savory Pate Roasted Chicken Dinner In Meaty Juices are not as important as the first five ingredients. However, collectively they still have a significant impact on the overall quality of the product. Therefore, we'll continue discussing the remaining ingredients in this Whiskas recipe. Next we have natural flavor, which is likely included to improve palatability. The next ingredient is calcium carbonate. Calcium carbonate is a naturally occurring mineral supplement. Although it's often used as a dietary calcium supplement, it can also be used as a preservative or color retainer. The remaining ingredients in this Whiskas Savory Pate recipe are unlikely to affect the overall rating of the product. In summary, we recognize that this product contains artificial colors and anonymous meat ingredients. Although the FDA has approved the artificial colors used in this product, they are unnecessary and unhealthy additions. Long term exposure can have serious consequences. See our article on artificial food dyes for more information. In regards to the anonymous meat ingredients, These are not necessarily always negative; however, they are typically low quality and inexpensive additions. If the particular anonymous meat ingredient is controversial or low quality, it should have been discussed earlier in this review. Otherwise, it is safe to assume the anonymous meat ingredient is an acceptable addition. The official PawDiet rating for Whiskas Savory Pate Roasted Chicken Dinner In Meaty Juices is 3.5 out of 5.